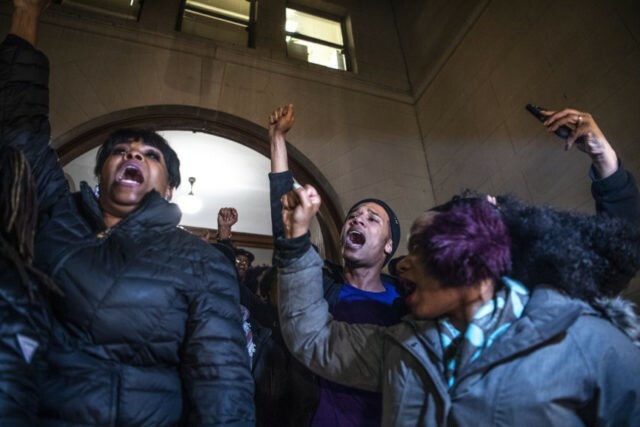 PITTSBURGH (AP) — Gunshots were fired overnight through the window of the attorney who defended a white police officer acquitted Friday in the shooting death of an unarmed black teenager. But police around Pittsburgh said there were otherwise no reports of arrests or property damage following the verdict that left Antwon Rose II’s family distraught but not surprised at the jury’s decision, they said. Patrick Thomassey told WTAE-TV he was called after midnight about the shots fired into the Monroeville building. He said he wasn’t hurt and found three or four bullet holes. Former East Pittsburgh Police Officer Michael Rosfeld was charged with homicide for shooting Antwon Rose II in the back as the 17-year-old ran away from a high-stakes traffic stop last June. But Rosfeld walked out of the courtroom a free man Friday after jurors rejected the prosecution’s argument that he acted as Rose’s “judge, jury and executioner,” in the words of an assistant district attorney. The verdict leaves Rose’s family to pursue the federal civil rights lawsuit they filed last August against Rosfeld and East Pittsburgh, a small municipality about 10 miles (16 kilometers) from downtown Pittsburgh. The reaction was measured after Friday night’s verdict, with a small group of chanting protesters briefly blocking intersections and entering hotels. Pittsburgh police tweeted the “peaceful demonstration” had resulted in rolling, temporary road closures. So far Saturday, no protests were seen in the streets. Rose was riding in an unlicensed taxi that had been involved in a drive-by shooting minutes earlier when Rosfeld pulled the car over and shot the 17-year-old in the back, arm and side of the face as he ran away. The former officer told jurors he thought Rose or another suspect had a gun pointed at him, insisting he fired his weapon to protect himself and the community. Neither teen was holding one when Rosfeld opened fire, though two guns were later found in the car. Michelle Kenney, Rose’s mother, said she was upset but unsurprised by the verdict, given other cases in which police officers have either avoided charges or won acquittals in similar shootings. “It isn’t what I hoped for, but it’s what I expected,” she said, adding she feels her son ended up dead because he was black. But a defense expert testified Rosfeld was within his rights to use deadly force to stop suspects he thought had been involved in a shooting. Prosecutors did not call their own use-of-force expert. “The prosecution’s handling of this case, particularly the decision not to call a police expert, raises many questions,” said Reggie Shuford, executive director of the American Civil Liberties Union of Pennsylvania.